The Redemptorists » Thinking about a vocation? Ever considered a vocation to the religious life? Wondered what it would be like to be a Redemptorist? Do you know someone in your life who might be thinking about a vocation of service in the Church? Our next Come and See weekend for men interested in learning more about the Redemptorists is April 25-28 at our formation residence in the Bronx, NY. Participants will spend the weekend at our formation residence at Immaculate Conception Parish. 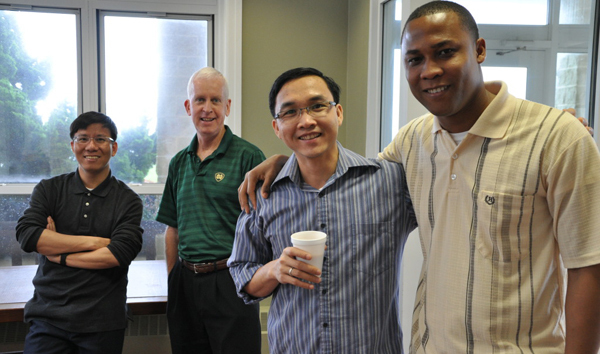 You’ll attend classes with our seminarians on Friday. The rest of the weekend will include time for community prayer, service, and learning more about who we are and where we serve. For more information, contact our vocations director, Fr. Richard Bennett at vocations@redemptorists.net or call 718-321-1394. You can also visit redemptoristvocations.com for more information. Whether or note you attend a retreat or invite someone, our seminarians and prospective candidates would appreciate your prayers!